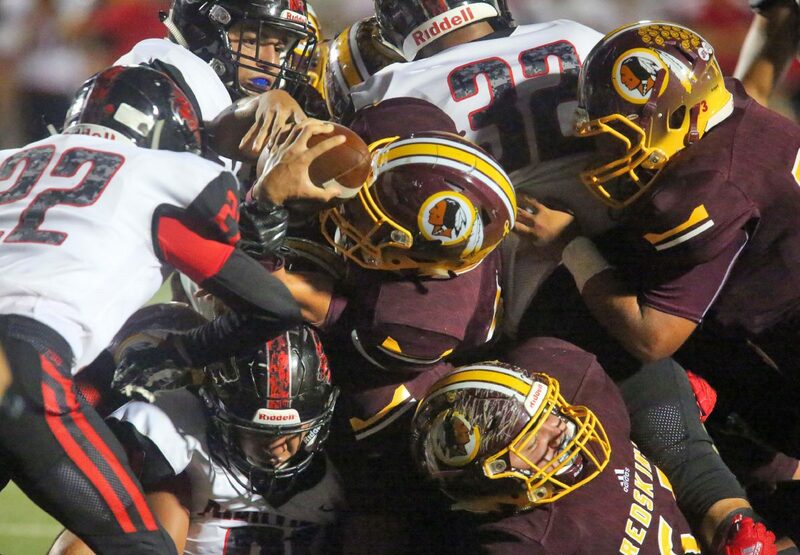 Donna High quarterback Ryan Espinoza (13) pushes the ball through to the endzone in a pileup the against the La Joya Palmview defense in a District 16-5A Division I game at Bennie La Prade Stadium on Thursday, Sept. 20, 2018, in Edinburg. DONNA — Donna High scored nine points, all on field goals, and clung to a six-point halftime lead at Brownsville Pace last week. The Vikings scored two second-half touchdowns, and Donna had no answer and lost. On its first possession of the game, Donna High faced a fourth-and-6 at the La Joya Palmview 27-yard line. Leal called a timeout and drew up a drag route for senior wide receiver Daniel Nino. The gamble worked. The play ended with Nino’s first of two touchdowns on the night. 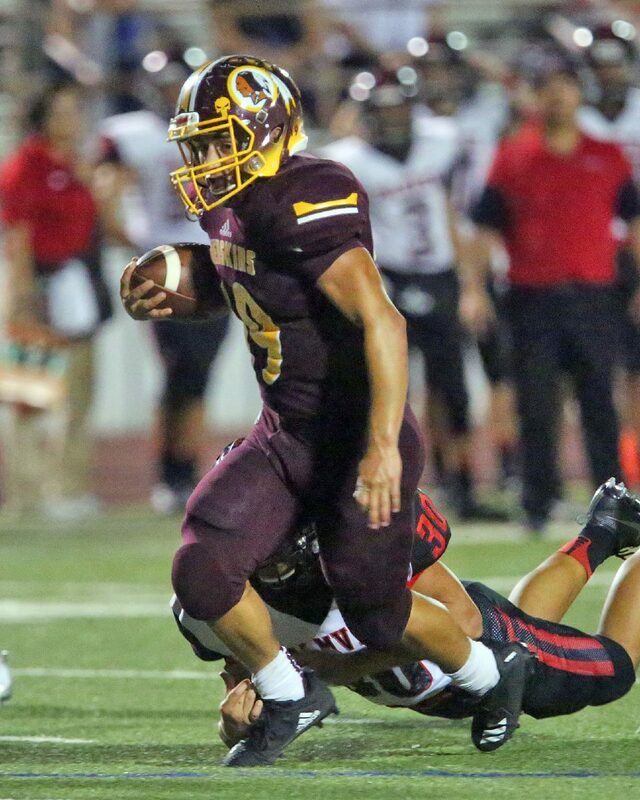 Donna High defeated La Joya Palmview 31-21 in The Monitor’s Game of the Week on Thursday night. Donna High running back Daniel Niño (18) carries the ball through the against La Joya Palmview into the endzone in a District 16-5A Division I game at Bennie La Prade Stadium on Thursday, Sept. 20, 2018, in Edinburg. 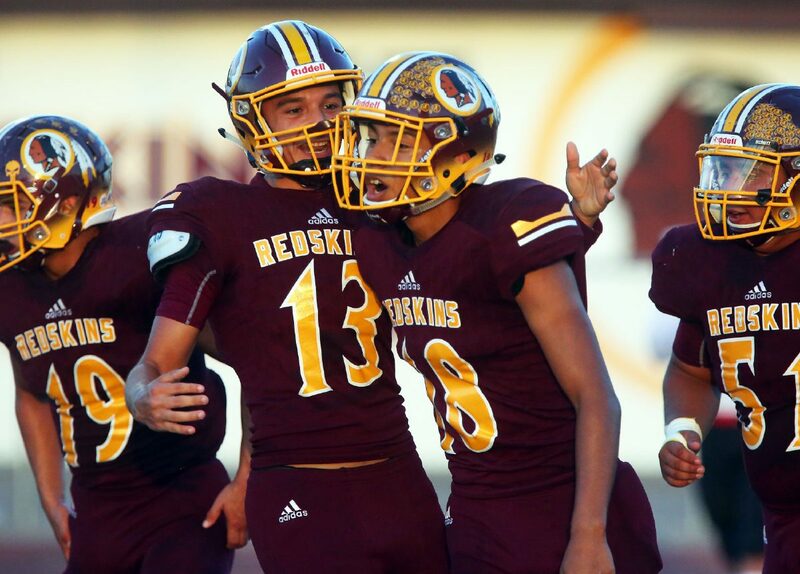 Donna High quarterback Ryan Espinoza (13) celebrates with Daniel Niño (18) after Niño's touchdown run against La Joya Palmview in a District 16-5A Division I game at Bennie La Prade Stadium on Thursday, Sept. 20, 2018, in Edinburg. 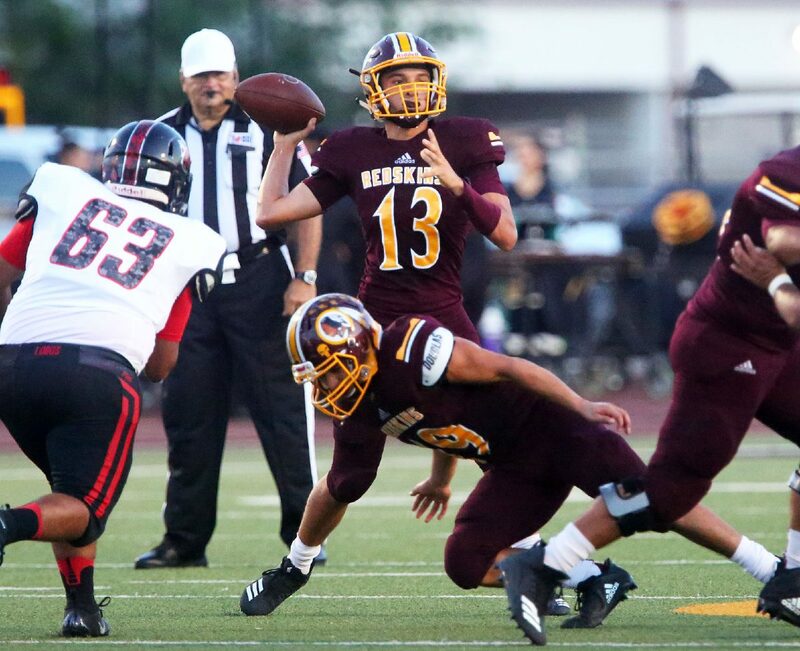 Donna High quarterback Ryan Espinoza (13) passes against La Joya Palmview in a District 16-5A Division I game at Bennie La Prade Stadium on Thursday, Sept. 20, 2018, in Edinburg. Donna High's Marcus Ysaguirre (19) carries the ball against La Joya Palmview in a District 16-5A Division I game at Bennie La Prade Stadium on Thursday, Sept. 20, 2018, in Edinburg. La Joya Palmview (2-2, 2-1) won the turnover battle (one Palmview turnover to Donna’s two), but ill-advised mistakes prevented the Lobos from bearing much fruit. Palmview safety Freddy Flores picked off Espinoza on a third-down play in the first half, but the interception was nullified because of a roughing-the-passer penalty. The Lobos were also without running back Mario Chapa for the entire second half due to injury. Chapa entered Week 4 tied as the top rusher in District 16-5A Division I.
Nino made three catches for 79 yards and the two scores, which were his first of the young season. Espinoza ran for 91 yards and two touchdowns on the ground in addition to his two passing touchdowns to Nino. 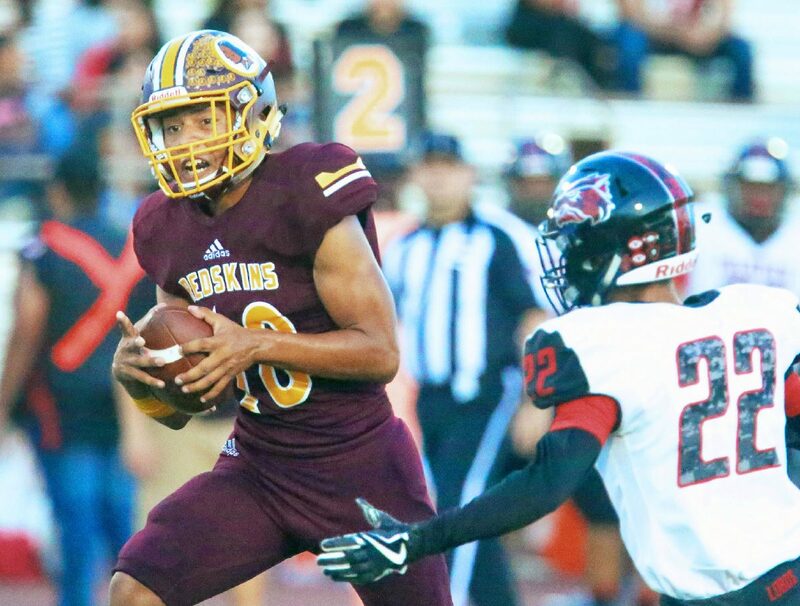 Donna (3-1, 2-1) defeating La Joya Palmview at Bennie LaPrade Stadium on Thursday was a continuation of a one-sided series dating back to 2008. Donna High now has seven wins in seven games against the Lobos. The teams used to play annually in an older iteration of 30-5A.